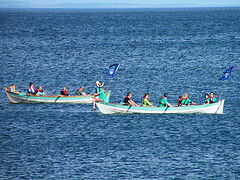 Car Free Day Bike & Boat Parade! 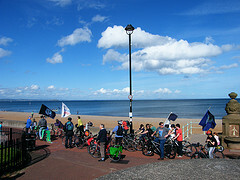 “Here in Portobello, Edinburgh, Scotland, the sun shone and 50 folk turned out on their bicycles to cel­eb­rate a world mov­ing bey­ond fossil fuels. We were blessed with won­der­ful sun­shine for Car Free Day 2011 (poster here), and we had a good turnout of all ages, earth flags, bikes, scoot­ers and row­ing skiffs. Some folk spent the morn­ing at the Orch­ard for the Equinox monthly work day and then cycled down to join every­one for the 2pm start. 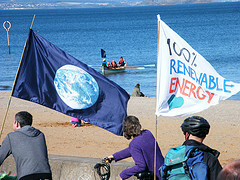 Others joined the ‘Moving Planet: mov­ing bey­ond fossil fuels’ March and Rally at Holyrood before cyc­ling down to join our bike and boat parade. Others man­aged to fin­ish the shop­ping, or even get out of bed, in time to join us! We had thought of hold­ing a time tri­al (see­ing how well a car, a bike, a skate­board, a skiff do racing against each oth­er if none of them are fossil fuelled!) but were informed by the police that all vehicles (except work vehicles) are banned from the Prom — which is a very good thing! Ok, why not try to guess which of these four pho­tos www.350.org chose to run with, and then think what title they might have giv­en it? 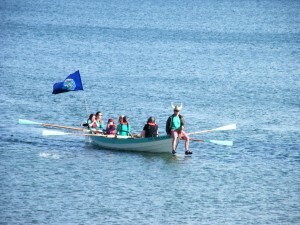 You can find out the photo and the unex­pec­ted title by click­ing HERE! This entry was posted in carbon reduction, Energy, Transport. Bookmark the permalink.